Paul Mutzabaugh's newest group, The Unknown New has just released their third album, not many neighbors. The talented list of musicians include Paul Mutzabaugh, Rich Stitzel, Jon Deitemyer, Chris Siebold, Jim Tashjian and Mike Pinto. Aaron McEvers large ensemble M13 launches its first album! A mix of jazz, rock and fusion meld well in this magnificently arranged and engaging work. Long format and storied tunes show a vastly talented group of musicians all performing at a very high level. It was a pleasure to not only master this record but to perform in it as well. 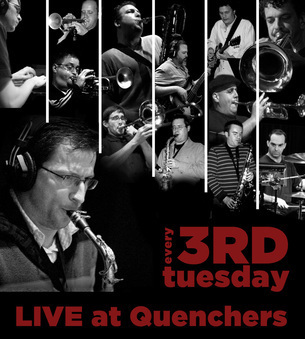 Come and check out this group perform every 3rd Tuesday of the month at Quenchers, Chicago, IL. The Humble Organisms blend R&B, rock, and funk with traditional jazz forms to create a powerful and energetic modern Organ Quartet. Their debut album to be released soon! Check them out! I had the pleasure of working with Marquis Hill on a couple of records, New Gospel and Sounds of the City. His highly melodic solo style along with a polished and smooth trumpet tone won him first place in the 2013 Carmine Caruso International Jazz Trumpet Solo Competition. Check out a few of the records! Pianist Ben Paterson has a new release on the MAXJAZZ label. Titled Essential Elements, Ben is joined by bassist Josh Ramos and drummer Jon Deitemyer featuring originals, standards and some covers as well. It was a pleasure to master this side, check it out!